Khmelnytska oblast was the first region of Ukraine where the Third phase of joint EU/UNDP Project “Community Based Approach” was officially launched. 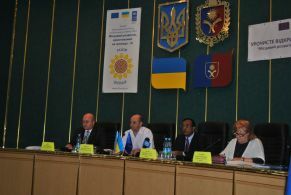 The presentation took place on 17 September during regional seminar under participation of Head of Khmelnytska Oblast State Administration Leonid Prus, Head of Khmelnytska Oblast Council Ivan Honchar, International project manager of EU/UNDP Project “Community Based Approach” Jaysingh Sah, Community development specialist of EU/UNDP Project “Community Based Approach” Olena Ruditch, leadership of rayon state administrations and rayon councils; and heads of village and city councils. During the launching of the Third phase of the CBA Project a Partnership Agreement was signed with Khmelnytska oblast state administration, Khmelnytska oblast council and UNDP. The Head of Oblast Council Ivan Honchar officially handled signed by oblast authorities trilateral agreement for the next 4 years. During the Launching seminar the head of Khmelnytska oblast state administration Leonid Prus mentioned that: “The level of living and self-sustainability of local communities are definednot only by its natural resources potential, but also by a human factor”. According to the head of Khmelnytska OSA, to stimulate people and local self-governing bodies to search for effective solutions of community problems, a motivation for joint actions is needed. “This particular what CBA Project teach us”, underlined Leonid Prus. During his welcoming speech the Head of Khmelnytska OSA stressed that “jointly we will address a number of social issues, which communities are facing. All this will allow to improve the level of living and wellbeing of people in Khmelnytska oblast”. «Today we can state with certainty: implementation of CBA Project in Khmelnytska oblast gave wonderful results, which at the beginning seemed to be unobtainable. In terms of the second phase of the Project 50 community microprojects were implemented for the total amount of UAH 9,6 mln. It was done thanks to the communities, which believed in themselves and in that they can change their life for better. It was done also thanks to local authorities, which supported these initiatives, and thanks to local coordinators», marked the Head of Oblast Council Ivan Honchar in his welcoming speech. An International project manager Dr. Jaysingh Sah informed that during the Third phase of the Project will support local authorities in dissemination of best practices and experience in participatory planning and further dissemination of the community based approach in Khmelnytska oblast. The Project activities will focus on rehabilitation of social and communal infrastructure in the area of energy efficiency, health care, environment, water supply, rural economy. 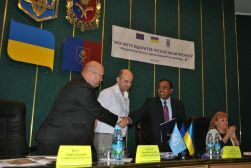 The Project will support Ukrainian Government in implementation of decentralization reforms and in dissemination of innovative approaches for participatory planning and for promotion of sustainable social economic development on local level through the knowledge management hub and through implementation of the appropriate courses into curriculum of 20 universities. 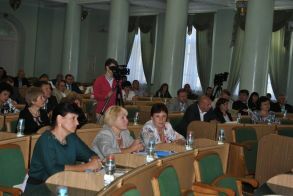 Participants of the regional seminar in Khmelnytska oblast were especially interested in the possibility of support of rural economic initiatives. Rayon representatives gave positive feedback and supported initiative of international organisation regarding support of rural territories. 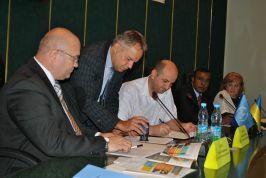 Implementation of the first phase of CBA Project commenced in Khmelnytsky region during May 2008. First phase was succeeded by a second phase in July 2011. Over these two phases, more than 40 ths. of men, women and children of the region have benefitted from improvement in 67 schools/kindergartens, 12 healthposts, 8 water supply, 5 school buses 8 street-lightning and so on. This happened through joint effort of the citizens, oblast/rayon/local level governments, CBA Project and the private sponsors.